I can't believe how long it's been since I last posted anything significant on here. Sorry guys! I guess Christmas is the place to start. We spent most of the day round at my mum's place but had a lazy morning at home first. Elizabeth was very well behaved and actually gave us quite a bit of sleep. We opened any presents we had, as well as Elizabeth's - she's not able to open her own just yet :) We had a pretty easy time at mums as well. We only had to do the feeding and changing; she was passed between family members the rest of the time. She even slept all through dinner, so Frans and I were able to eat a hot meal without being disturb. That's not happened since we brought Elizabeth home from the hospital. After another good night's sleep, we spent the best part of Boxing Day at my dad's. We had to pry Elizabeth out of my dad's arms when it was time to go home though! Another day in good company with good food. We then hit a small milestone - Elizabeth outgrew her newborn clothes. I was actually a bit emotional when I realised that she would never wear her going-home-suit again (the Baby Love all-in-one), which we bought so she would look gorgeous coming home from the hospital. Even now I can't quite bring myself to pack it away. Then the New Year started. 2010 has been a real rollercoaster ride but we finished on a high. The two of us just about managed to see midnight before we hit the hay. Elizabeth slept well again and it was starting to look like that might be a regular thing. Two four-hour stints, give or take thirty minutes, was bliss compared to the waking up every two hours we'd had before Christmas. Elizabeth's weight has continued to steadily increase. On December 29th (3 and a half weeks old) she weighed 3.9 kg (8lbs 9oz), January 6th (5 weeks old) she weighed 4.27kg (9lbs 6.5oz) and on January 20th (7 weeks old) she weighed 4.71 kg (10lbs 6oz). Totally average! Her length on the other hand is NOT totally average. Whilst she was born measuring a 'normal' 51cm, she now measures approximately 59cm at 8 weeks old. Apparently that's quite long. This means that she has nearly outgrown her 0-3 months sized clothes as she stretches the all-in-one suits to their limit. 'Lanky Lizzie' springs to mind but you dare start calling her that! We've seen some huge developments in Elizabeth over the last 8 weeks. The best one for us has been the smiling. 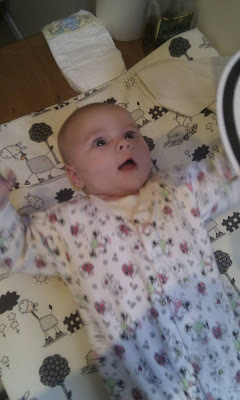 There are some things which Elizabeth gets really excited about and she giggles, waves her arms and legs about, wiggles all over the place and follows whatever it is that's got her so excited. It's wonderful to watch.